Padma Vibhushan Prof. Yash Pal, eminent scientist and academician is no more. The science and technology fraternity in India has had two shocks in the last two days. First it was the sad demise of space scientist and ex-ISRO chief UR Rao and second, passing away of Prof. Yash Pal. Prof. Pal breathed his last at his Noida residence late night yesterday. He was 90 and a lung cancer survivor. 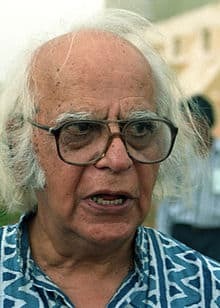 Many of you who grew up in the 90s may know Prof. Yash Pal through his regular appearance on Doordarshan's 'Turning Point'. He also answered questions asked by readers of The Tribune through his regular column in the newspaper. Prof. Pal was born in 1926 in Jhang (now in Pakistan). He graduated in 1949 with a degree in Physics and went on to get a PhD in Physics from MIT in 1958. He began his career with Tata Institute of Fundamental Research (TIFR) Mumbai and served there till 1983. Afterwards, he served as the chairman of the University Grants Commission from 1986 - 1991. Prof. Pal was awarded with Kalinga Prize by UNESCO for his contribution towards popularizing science among masses. You will be missed, sir. RIP. Padma Vibhushan Prof. Yash Pal, eminent scientist and academician is no more. The science and technology fraternity in India has had two shocks in the last two days. First it was the sad demise of space scientist and ex-ISRO chief UR Rao and second, passing away of Prof. Yash Pal. It is indeed sad. I knew both of them. Even Worked with Prof.Yash Pal when he was Secretary, DST between 1984-86. A fine person,who would brook no nonsense.